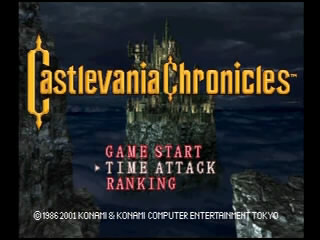 Released in 2001 for the Playstation, Castlevania Chronicles is developer Konami's remake of their smash hit original game. Featuring updated graphics, several new moves since the NES days, and an awesome soundtrack, players can again pilot Simon Belmont through the familar levels of Castle Dracula, as well as a few new areas. X68000 computer. It is the fifth rendition of Simon Belmont's original quest to kill Dracula (after Castlevania, Vampire Killer for MSX, Haunted Castle for arcade, and Super Castlevania IV). The PSX version was released in 2001, but I began playing the X68000 rom on an emulator a year or two before that. It was a natural choice for me to attempt a speedrun. Thanks to Radix, Nate, Mike, Flip and the rest of the staff that have made SDA the great community it is. Thanks to zggzdydp's tool-assisted run for five tricks: the subweapon trick on the Werewolf and Doppelganger, the boss technique on Block 1, the soldier trick on Block 4 Stage 11, the exploding skeleton trick on Block 7 Stage 19-20, and the Giant Bat trick on Block 8. Thanks to Persona's earlier Time Attack videos, because.without watching those first and seeing what was possible I don't think I could have approached doing my own runs. Thanks to Sir VG for convincing me to not be satisfied with merely fast times and to keep trying until I couldn't do any better. 1) Jumping is slower than walking (for the same horizontal distance). If you jump only when necessary you can shave a few frames here and there. This is more important on Time Attack mode, which is measured in tenths of a second. 2) Getting hit while on stairs does not slow you down as it would in many other Castlevania games. It is a good strategy to plan when you can get injured to save time, and try to do so while walking up or down the stairs. 3) You can jump through certain enemies if you whip them at the same time. This works on the tree enemies and archers on Block 3, the spider on Block 7, the Giant Bats on Block 8, all the bone pillars, and some types of skeletons. This allows you to skip quite a few enemies to save time. 4) You can activate an animation glitch that allows you to use a subweapon while continuing to walk. You do this by jumping and whipping twice prior to using the subweapon. The TAS uses this trick extensively, but it is harder to use on a real console. I use it on the Tower of the Dolls (Block 6 Stage 17) to clear out some enemies above the stairs. 5) Some bosses can be hit by a subweapon and the whip simultaneously. This deals a ridiculous amount of damage in a single frame and shortens the boss fights considerably. The TAS uses this trick to great effect. I use it on the Werewolf and the Doppelganger. Block 1: This level is short and largely depends on two things. One, don't waste time jumping or getting hearts you don't need. Two, you must hit the Giant Bat seven times before the Stopwatch runs out. Block 2: This level requires that you precisely time your attacks on the booger walls and the Dragon boss, because you can only damage them after a certain interval of time between each hit. The rest of the level is pretty straightforward. Block 3: This is one of the worst levels in the game to speedrun because there are a half dozen spots where things can go haywire, and any combination thereof. The flea men, the caterpillars, the water drops, and the boss are all prone to random behavior. Technically you can get past the tree enemies by only jumping once, but it changes the timing of the flea men and makes the area more difficult, so I jump twice. I used Persona's knife trick on the boss to wipe him out quickly. A note on different versions of the game: the Japanese disc has different hit detection on the boss, making the fight about 3 seconds shorter than the North American version. In the NA version there are places on the screen that the knife cannot reach. This forces me to wait for the boss's second attack. In the JPN version you can hit the boss immediately when he appears. Block 4: There are lots of places on this level where you can take damage to save time, especially on Stage 10. There are two possible improvements for this run overall. One, if you're frame-perfect on Stage 12 you can get past the skeletons without being hit, which then allows you to skip the meat near Medusa. Second, the Medusa battle can be done .7 seconds faster with a perfect pattern of Holy Water, but this is very rare. Block 5: This level involves dozens of precise jumps. There are two possible improvements. First, you can get across the large gears on Stage 14 in one less jump. Second, it may be faster to get hit by the bone pillar or its fireballs at the top of Stage 15 rather than taking the time to kill it, but that would leave you with only 1 bar of health during the boss fight. I use zggzdydp's subweapon trick on the Werewolf to hit her for 6 damage at once. Block 6: The temptation here is to use the Stopwatch in order to get through the Tower of the Dolls without having to kill so many enemies, but in the end it actually costs you time. Regardless, you'll need the Crosses to beat the Doppelganger quickly. It is possible to get through the hall of mirrors about .7 seconds quicker if you use the TAS technique, but I didn't have much luck reproducing it on a real console. Interesting fact: the Doppelganger uses the same subweapon and heart supply as you, but he will never use the Herbs to regain his health no matter how many hearts you have. Block 7: I played this level more than any other to get an ideal time. It seemed every few weeks I would discover a new way of skipping an enemy or saving some health until I could get well below 4 minutes. Not only is this the longest level of the game, but there are a ridiculous number of places where things can go wrong: jumping over the exploding skeleton, killing the ogre, jumping through the spider, jumping toward the spike trap, jumping over the pendulum, getting past Frankenstein's Monster in one hit, jumping through the two bone pillars, avoiding the Medusa heads, and finally killing Death in a timely manner. I deliberately played and replayed this level until I managed to get an enemy to drop Crosses. That alone saves three seconds, because you don't have to walk past the stairs on Stage 21 to get Crosses from a candle. I did make two mistakes here: I threw Crosses at the blood skeletons on Stage 21 rather than simply jumping and whipping them, and I had to jump twice to kill an axe knight in the long hall before the boss. Block 8: This is another level that came together gradually until I could finally get below 3:30, but even so I needed a lot of luck to get this record time. I jump over the sword knights not so much to save time but to manipulate the game's luck/drop generator. Very often the enemies will drop Herbs or Holy Water on this level, but skipping the first enemy reduces those odds. I used the TAS trick to get through the Giant Bats a bit more quickly on Stage 23, and I got lucky on Stage 24 by picking up a potion. Dracula can be rather unpredictable but was nearly perfect for me here. It could only be faster if Dracula's second form doesn't jump at all.